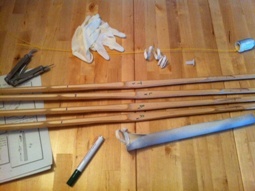 Armed with an excellent free kendo equipment manual (courtesy of the Fukuda Budogu company) I dismantled the shinai into it's components and found everything in order. No splits, no splinters and defects in the tsuru (the yellow string) and the leather parts. Putting it back together I rotated the bamboo slats' order, making the original bottom slat now the left one. The reasoning behind this being that this will ensure even wear an tear on the whole shinai. Getting the tsukagawa (the leather grip) off the handle proved a challenge since it's so tight. However, as suggested by the guidebook, latex gloves quickly solved that problem! The whole process took me little over an hour. Lessons learnt? That I'll need some practice in retying the tsuru because right now it's not as tight as it could be. I recently saw a great documentary on the production of shinai (part 1 and part 2 on YouTube). I don't know if it applies to my model, but in general the creation of one is quite a few hours of manual labor. It was great seeing the artisan go through the steps of making a sword, starting with newly dried bamboo branches. There aren't many anime that focus on kendo, the most famous one being a series from the early eighties: Musashi no ken (lit. "the sword of Musashi"). Another, much more recent one, from the fall of 2007 is Bamboo Blade. 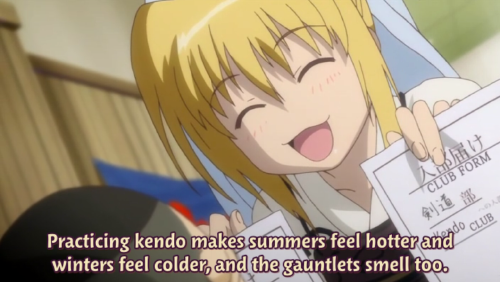 The screenshot above is from the show, ridiculing one of the commonly known aspects of kendo: kendoka and their equipment stink, especially during summer (^_^);. Bamboo Blade really isn't that good: I'd qualify the art as meh, the story as generic (though it's growing on me after a few episodes) and the animation as crude. But still, it's about kendo, it does a fair job of portraying shiai and it conveys the enthusiasm kendoka have for their sport pretty well! Like a few weeks ago, today was a small class in the dojo. Only eight guys in bogu and three newbies in keikogi. Before warming up with suburi and stretching (no running at all this week, that felt odd!) the whole group focused on studying kata. I'm very grateful for the help of Raoul, a visiting member of our Amstelveen dojo, who provided me with some good insights on kata 1 through 3. After that sensei Ton took us rookies apart for some practice and uchi geiko, while the rest of the group spent the remaining hour sparring. Now the only thing I need to figure out is why the heck I keep getting these splitting head aches after training. I get back home around 1200 and you can bet dollars to donuts that by 1300 I'll have a head ache that lasts until I go to sleep at night. Menno suggested that it might be a hydration problem, but it even occurs now that I'm downing 1.5 to 2 liters of water in the morning. Personally I'm thinking it might have something to do with the muscles in my neck and how I use them during kendo. After missing four weeks of training in a row (family stuff, spring cleaning, Queen's Day and Anime 2011) I finally got back to the dojo today! Training with Martijn in our yard has been very helpful, but of course there's no substitute for the watchful eye of sensei and training with the other 15 folks in our class. Despite the fact that the past two weeks I've held back on training, the warmup routines came pretty easily! The usual stretching and suburi, two laps of suri-ashi and three laps of fumikomi-ashi. Usually I'm pooped after the laps of suri-ashi, but not this time. Nice. Either way, starting from next week I'll run to/from the office again on a daily basis and I'll also train at home at least once a week. Back to my old schedule! My do strikes are improving! Recently we have been running into an interesting problem between BoKS 6.5.3 (FoxT Server Control) and Putty. Situation: End user's password has expired and must be changed upon login. Symptom: On password change, Putty crashes with the error "Incoming Packet was garbled on decryption. Protocol error packet to long". Temp solution: Set customer's last password change date to very recently (eg: modbks -l $USER -L 1), then have customer login and change the password manually (eg: passwd). Earlier we reported a bug that would make Putty crash when trying to change your password upon login. The rather cryptic message provided by Putty was: "Incoming Packet was garbled on decryption. Protocol error packet to long". Here's an update on that matter. BoKS Master: If you already have TFS090625-101616-1 installed on the Master but not TFS081202-134416-3 (i.e. rev 3) you may want to uninstall TFS090625-101616-1 temporarilly and then install TFS081202-134416-3 and TFS090625-101616-1 (in that order). BoKS Replica: Hotfix 090625-101616 does indeed contain the corrections from 081202-134416 (rev 3). Thus hotfix 090625-101616 is sufficient on the Replicas in this case.